Fans - myth or fact? In Texas heat, I use frozen bottles of water to keep our lactating momma cool and comfy. She loves them and will lick as well as lay along side them. Have heard that pedestal fans are not good for keeping the rabbits cool. Is this Myth or Fact and why. It's a fact that a fan blowing directly on the doe is not be the best thing. Rabbits don't like drafts. In hot dry weather, the rabbit might dehydrate fairly quickly, and in cold weather, a rabbit's immune system might take a nosedive. Rabbits tend to get sick in continually drafty living spaces. If the fan were not blowing directly on the rabbit, you might successfully use it to improve air circulation in a barn or rabbitry, and therefore cool the animals. But, what if you can use the fan to create a swamp cooling effect?? Try draping the cage with wet burlap, and then blow the pedestal fan at the wet burlap. Inside the cage I would expect to cool down significantly. You'd have to find a way to keep that burlap wet. Or how about using heavy shade cloth in the place of the burlap? (This should be quite a bit more durable.) Put a drip of water or a very fine spray over the shade cloth, and use the fan. We live where the temperature in winter usually goes below zero at night and sometimes for a few days at a time. 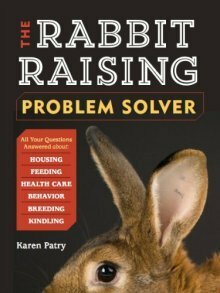 What do we need to do to provide shelter for our rabbit who is currently in an all wire cage with roof added on and plastic stapled to the sides and back? Good question, and it sounds like you've already done what is needed -- ensure no drafts. The rabbit won't have any problem with the cold; it is the drafts that will stress it. So, if you put plastic on 3 sides and ensure the front is not facing the prevailing wind, you should be good. On those days you know the temps are gonna drop into the basement, you can provide a bit of extra insurance by stuffing the cage with straw or hay. This will serve quite well as insulation and protection from the wind. Lastly, if you can make friends with local rabbit breeders that are familiar with caring for rabbits though the winter, you'll have an additional source of information, help and inspiration. You pretty much have your cage all set! Just make sure the cage is on the protected side of your house and stuff it with straw or hay. I stuff hay into small boxes for my rabbits that is like a den for them. They burrow themselves into it and they are fine. But yes you pretty much have it covered!